With the first part of Japan report almost ready, I've prepared another solaro suit themed post for you. 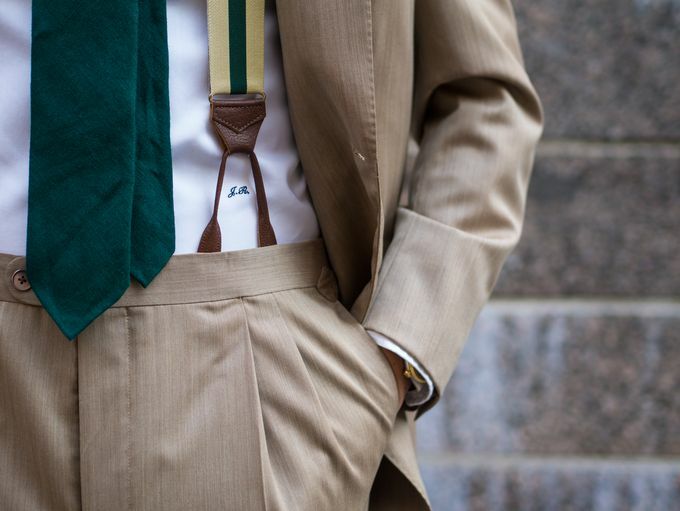 In the last one we focused on creating so-called "dry looks" with a solaro suit or basically any beige summer suit, but this time we're exploring how to wear the color green with a beige suit. As always I'll let pictures speak for themselves, but we'll go through some basics on paper as well. Now, I would argue green is one of those few colors where the tone of the color often has to be nailed just right in order to create the look you want. More than in other colors, the different shades of green can be entirely different when it comes to compatibility to other colors. 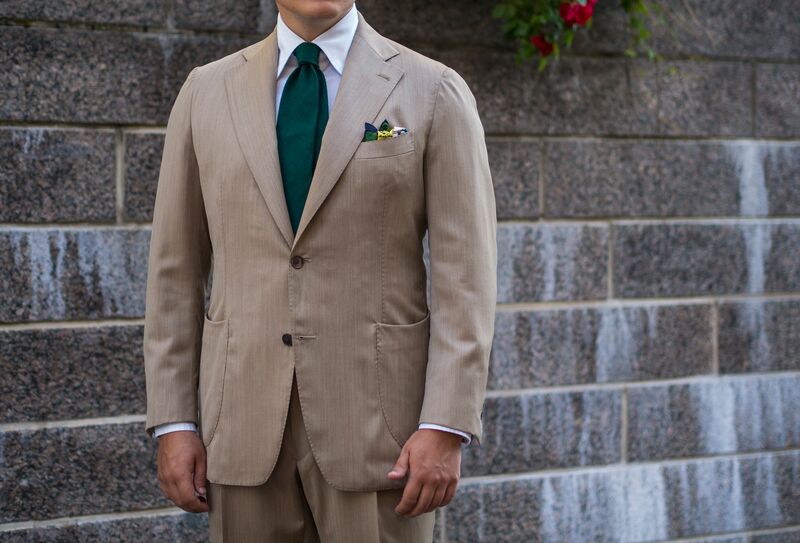 For example, olive green is often very usable to with moth suits and jackets and throughout the year. However, medium green can be an incredibly hard color to pull off in any circumstances and definitely does not combine well with most suit colors. When it comes to wearing a beige suit or a jacket, the greens that works well tend to be on the warm side, like olive, but not always. 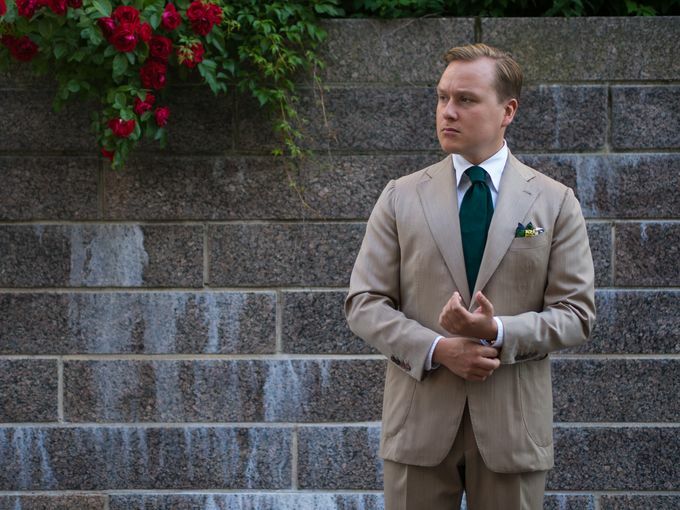 In this post's look I've actually gone for a more blue tone, sea green, and combined it with a crip white shirt and a complementing pocket square. 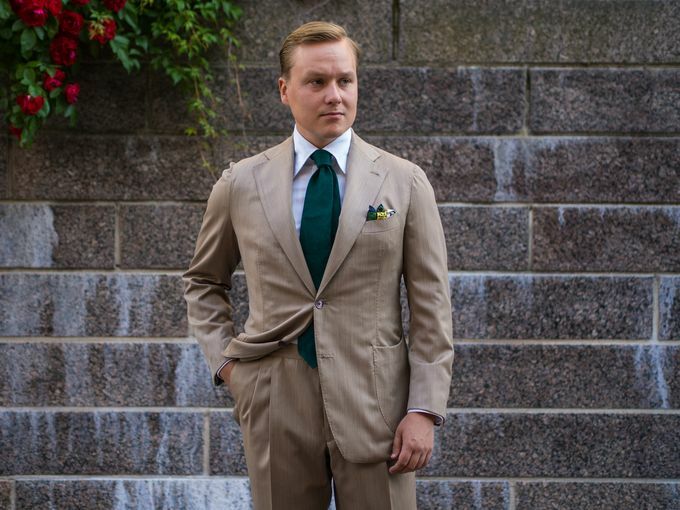 Due to the warm beige color of the solaro wool suit, the sea green balances the palette, working somewhat similarly as a navy tie would in this look. 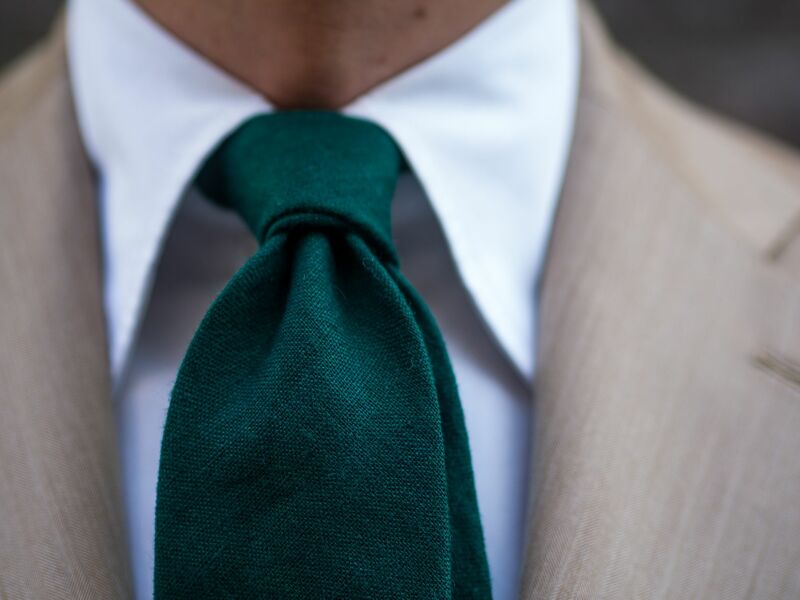 The dark color and the textured and non-shiny finish of the raimie tie also make sure that the colors don't seem too bright or overpowering which can be a problem with most green accessories. 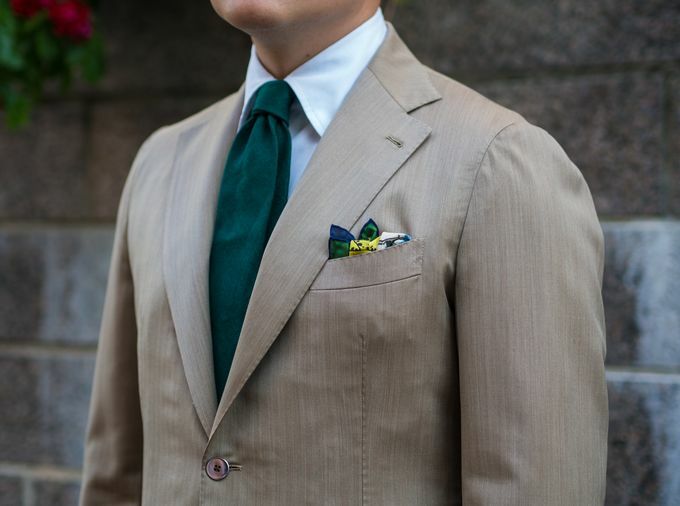 So, as we've discussed a common problem with wearing a green tie or a green pocket square is that most shades of green tend to be very overpowering and too saturated in color. This makes them stand out a bit too much and can lead to a very unbalanced look. I think one of the reasons to this is that green is not quite as natural a color to be seen in clothing and therefore pops a bit more than its counterparts. In any case, if you're wearing a green tie it can be a good idea to use a simple white pocket square to keep things calm. 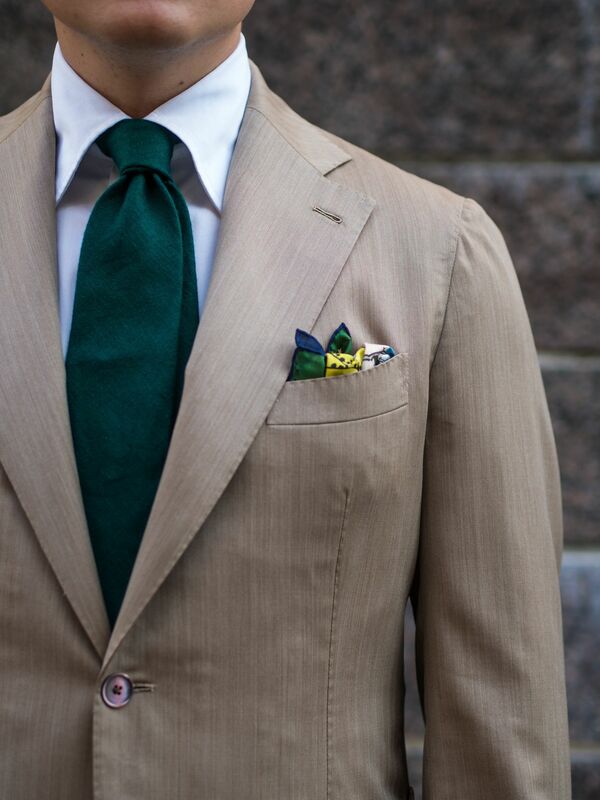 If you don't, simply make sure the pocket square remains subtle and utilizes other colors on top of green. 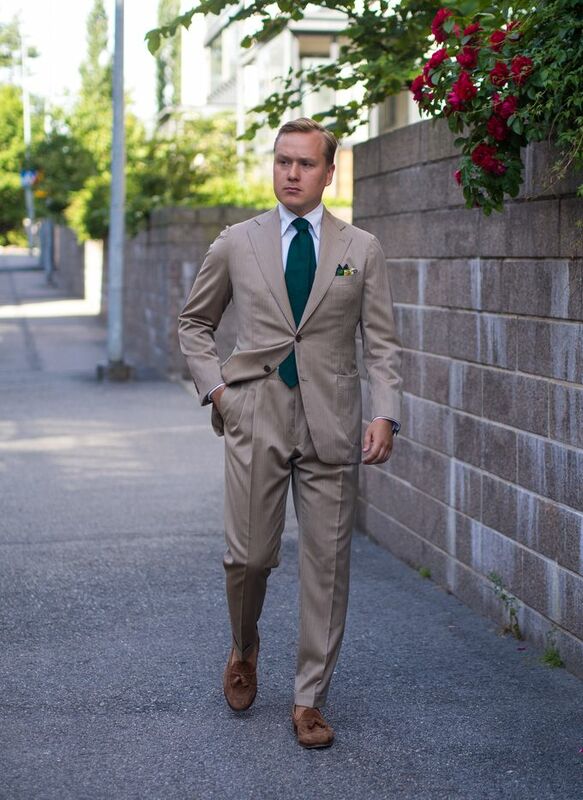 This way you'll most likely avoid looking like you're on your way to a St Patrick's celebration. 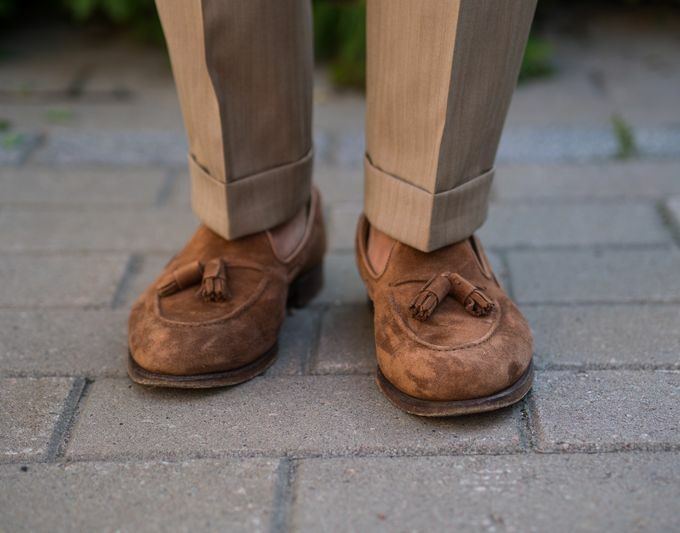 Now, it doesn't really matter what kind of shoes you're wearing with your green accessories as it is more a question of wearing appropriate shoes to your entire outfit. 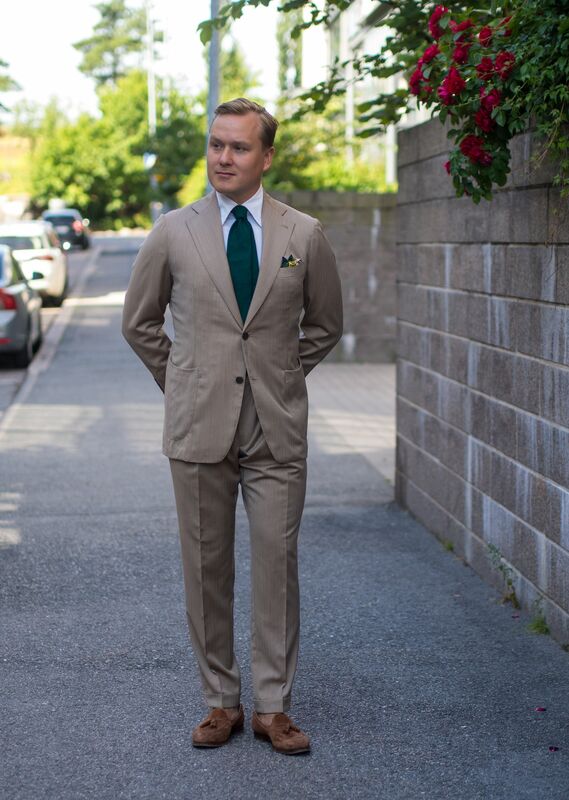 I will say though that I myself often avoid wearing green with black shoes and my more formal looks. 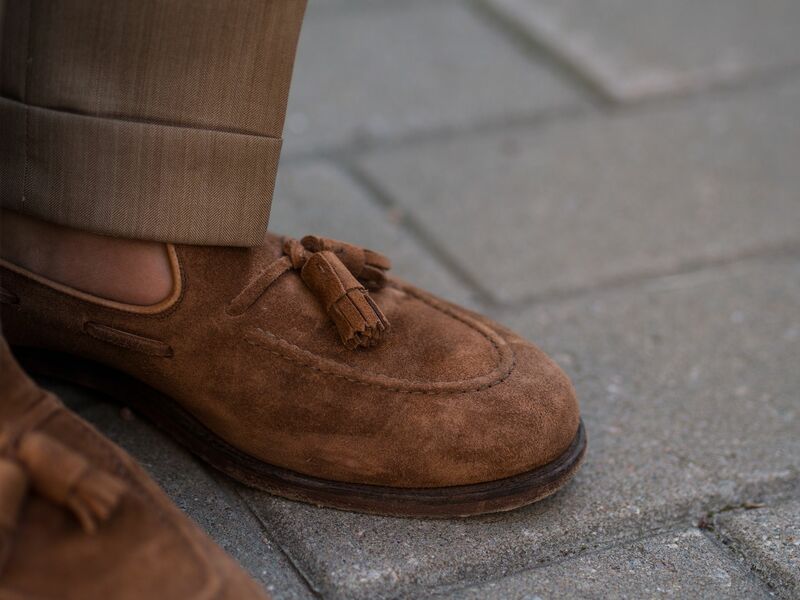 The color simply feels slightly off to be paired with black and seems more at home with different shades of brown. I will probably post the next article still within this week, and if things go as planned it will be a short travel report of one of my favorite places in Japan. Naturally it will not be all about the location though and several style-related things will be included in it. Stay tuned and see you again soon!